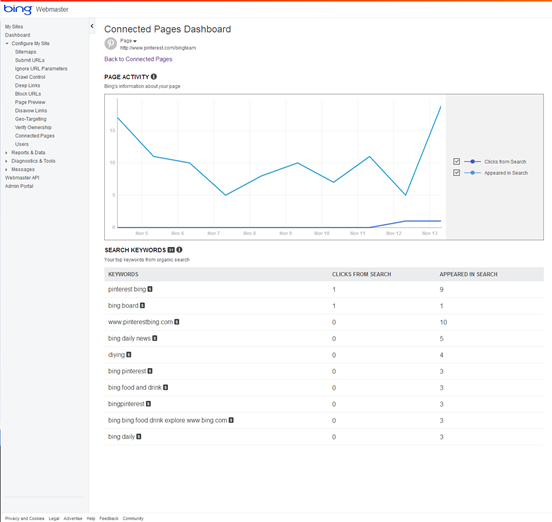 Microsoft in November 2013 added a nice little feature to their Bing webmaster toolbox – Connected Pages Dashboard that allows you to tell them what pages you own under your social network. Once verified these social profiles, Bing connects the dots and you’ll be able to see all kinds of information from inbound links to search terms for those Connected Pages. 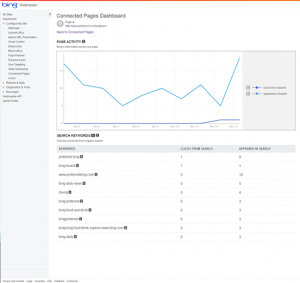 Sign into Bing Webmaster Tools and select Connected Pages from the Configure My Site section. Complete the URL path for the various media networks associated with your page on that network. This usually takes a few minutes, if you are filling out multiple networks at the same time. Make sure your connected page profile has a link to your site’s URL or it won’t be verified and you will see an exclamation mark. If everything is successful, you won’t receive feedback and data will start showing up, within 72 hours or less. With this latest add-on to the webmaster tools, Bing not only provides traffic data from your website, but nearly from all your owned media. If you aren’t using Bing Webmaster Tools, this makes for a compelling reason to start.